A gym bag is essential to store your workout clothes. For large loads a large cargo style might be best. For just a few items a cheap lightweight drawstring duffle bag should suffice. Every Golds Gym bag in the workout clothes store is in-stock. 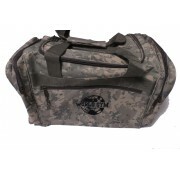 gym duffle bag by Worlde Gym in Digital Camo ..